Several million years ago, a series of nearby supernovae explosions lit up the sky, rained radioactive particles down on our planet, and might have kickstarted a major climactic shift. 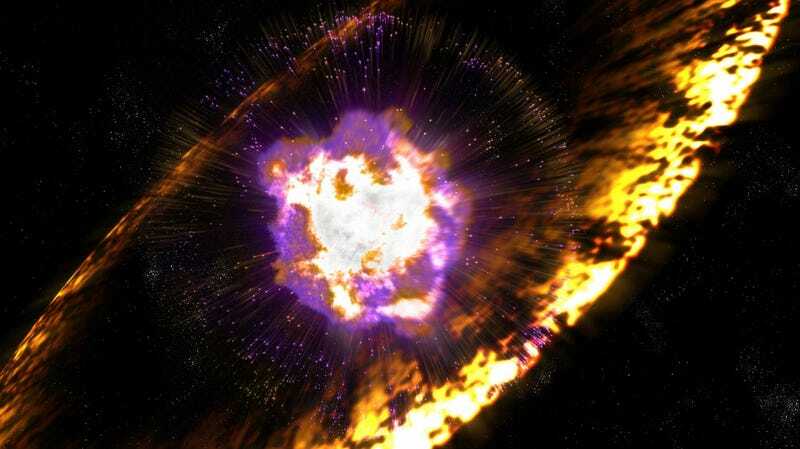 That’s according to a pair of studies published today in Nature, which link radioactive debris spread across the seafloor to cosmic fireworks hundreds of light years away. Now, in one of the most detailed analyses to date, an international team of researchers has shown that not-too-distant supernovae have affected the Earth in the not-too-distant past. The first hints came over a decade ago, when a research team at TU Munich discovered evidence of iron-60 in geologic samples collected on the Pacific seafloor. A radioactive isotope that decays with a half-life of 2.6 million years, iron-60 is produced abundantly in stellar explosions. Intrigued by the find, Anton Wallner from The Australian National University assembled an international team to scour the seafloor for additional evidence of stellar entrails. As for where exactly the cosmic eruptions originated? A second study out in Nature today attempted to answer that exact question, by modeling iron-60 transport through interstellar space. The study found that the nearest of the explosions probably occurred in an aging star cluster some 326 light years away. While that’s not exactly our cosmic backyard, it’s close enough to have left an impression. If you were alive on Earth a few million years ago, a deep blue object, small as star but bright as the Moon, would have made a dazzling addition to your night sky.